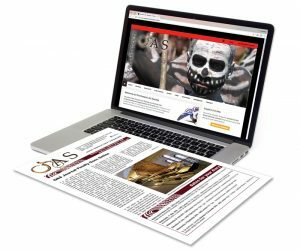 The Oceanic Art Society Journal is published 4 times yearly: in March, July, September and December. View the journal as an online publication or download as a PDF. The Journal is a quarterly newsletter featuring illustrated international oceanic art news, editorial pieces, member articles, books reviews, seminar reports, museum reviews, gallery and auction news, and information on the Society’s upcoming events. Become a member to support the Society and have a printed copy delivered to your door hot off the press.